(LAS VEGAS, NV — October 26, 2011) – World-renowned acrobat Jesus “Half Animal” Villa will kick off this year’s Las Vegas Sports Park Expo as he sets two new Guinness World Records on spring-loaded jumping stilts. The event will take place at the Las Vegas Sports Park outdoor field on November 12, 2011, at 4pm (PDT). Team Half Animal founder Jesus Villa will make an attempt at two new Guinness World Records in acrobatics, for the most consecutive front flips on spring-loaded stilts and the longest front summersault on spring-loaded stilts over a vehicle. These records will be added to Villa’s previous three world records, making him an impressive five-time world record holder. Spring-loaded jumping stilts are metal apparatus with curved carbon fiber springs attached to the lower leg that use gravitational energy to provide its user with incredible height and speed. The biggest challenge in performing a series of front flips comes from the amount of pressure taking place at each landing. Jesus “Half Animal” Villa will take a shot at breaking the current record for the most consecutive front flips on spring-loaded stilts by flipping across one hundred yards. His aim is to perform twenty consecutive front flips, allowing him to break the set record of fourteen. On the same day, Villa will make his attempt at breaking the record for the longest front summersault on spring-loaded stilts over a vehicle by breaking the current record of twenty feet. With no more than a 40 meter run, Villa will have to propel himself at least 18 feet into the air, over a vehicle, and land at a distance of more than 20 feet from the take-off. The Las Vegas Sports Park hosts over 250,000 visitors a year for a wide variety of sports that include soccer, basketball, mixed martial arts, strength training, club baseball, kickball, batting cages, and paintball. The complex attracts individuals of all ages who are interested in maintaining a healthy lifestyle while engaging in team sports and hobbies. During the Sports Park Expo, visitors will have the chance to participate in various activities, exhibits, and contests. Guinness World Record attempts for most consecutive front flips on spring-loaded stilts and the longest summersault on spring-loaded stilts over a vehicle to benefit Ronald McDonald House Charities ® of Greater Las Vegas. Download Photos, Media Release: www.halfanimal.com. For donations to RMHC of Greater Las Vegas, please visit www.rmhlv.com. 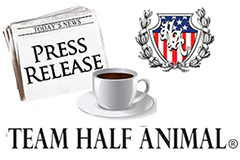 Half Animal news and videos can be found on www.halfanimal.com, www.facebook.com/teamhalfanimal, www.youtube.com/halfanimal, and Twitter @HalfAnimal. For more information on the Sports Park Expo, visit www.lvsportspark.com. Jesus “Half Animal” Villa, founder of Team Half Animal and Creative Assistant Director to legendary fashion photographer David LaChapelle, has been performing professionally as an acrobat for over ten years. Past achievements include performing over 5,000 shows with Cirque du Soleil (La Nouba, Zumanity), obtaining three Guinness World Records, and choreographing for the Beijing 2008 Olympic Games closing ceremonies. 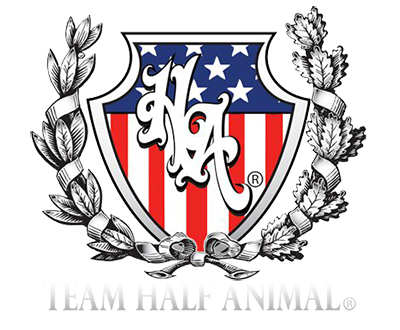 He has been featured on A&E with Criss Angel, on “The Winter Olympic Pre-Show” as well as in numerous campaigns for EdHardy, Von Dutch, H&M, Motorola, Nokia, and Infiniti Comcast. On top of gracing the covers of magazines such as The London Times, Photo magazine, and Show Biz magazine, he has also shared the stage with some of today’s biggest stars, including Sean “P. Diddy” Combs, Usher, Jennifer Lopez, Busta Rhymes, Gwen Stefani, Deborah Cox, Lil Jon, Tony Hawk, Daddy Yankee, and Elton John. His most recent work includes the choreography for Comcast 3D’s international campaign, a performance in Qatar for Stars of Science that aired in 13 different countries, the stunt/choreography for Super Cr3w’s performance at America’s Best Dance Crew season 6 finale, and a performance in Howie Mandel’s Mobbed series. Half Animal currently holds three world records: for being the only man ever to perform a double back flip on jumping stilts (2002), for performing nineteen body-straight jumping stilts back flips, also known as “whips,” across one hundred yards (2007), and for performing thirteen consecutive ninety degree push ups (2010). The best medicine for a sick child is having Mom and Dad at their side. Ronald McDonald House Charities® (RMHC®) of Greater Las Vegas makes this possible by providing a “home-away- from-home” at the Ronald McDonald House® (RMH®) for families who travel to Las Vegas to receive critical medical treatment for their children. The Ronald McDonald House provides a comfortable, supportive environment where families can sleep, eat, relax, and find support from families in similar situations. • Lunch is on Us – RMHC volunteers prepare and deliver over 550 sack lunches each week to families staying with their children at local hospitals. • Ronald McDonald Care Mobile® – In partnership with Nevada Health Center’s Miles for Smiles, RMHC provides access to dental care for underserved children in five rural counties in Nevada. • RMHC of Greater Las Vegas Scholarship Program – RMHC awards an average of $250,000 each year in scholarships to local high school seniors. RMHC of Greater Las Vegas receives a majority of its funding through local fundraising efforts and community donations – all of which stay right here in the Las Vegas community.